I first came across permaculture in the late 1980s, meeting a designer traveling with the first two permaculture texts. My charity work at the time kept me plenty busy enough, but eventually in 1996 I was 'cornered' when a permaculture design course was hosted in the shared house I was living in. This life-changing event sent me off in a new direction, learning as much as I could and making a number of different gardens along the way. Writing up these designs earned me my Diploma in Applied Permaculture Design in 2003 and I started teaching the following year. I discovered this made my heart sing, so I gradually made it my main focus. Since 2004 I've taught over 80 two-week design courses (as of July 2017), something I've no intention of stopping. I feel it's a privilege to have the opportunity to teach "something that can make a real difference in all our lives". I'm also excited about new ways in which permaculture thinking can help us, developing new courses on using its principles to help us design for optimising our health and creating ethical livelihoods. I've volunteered at the Permaculture Association since 2000, first as a trustee (5 years), then as part of the Interim Diploma Development Team and later the Diploma Working Group. I've also served on the Education & Farming Working Groups. In the spring of 2012 Permanent Publications published my first book 'Permaculture Design - a Step-by-Step Guide', which evolved from a set of design course worksheets. I also write occasionally for magazines and from time to time share interesting items on my blog. I'm currently writing a second book, about a subject I'm especially fascinated by, the use of systems thinking and patterns in permaculture design'. * The permaculture design process (I've published a book on this subject: 'Permaculture Design - a step-by-step guide' Permanent Publications 2012). * Training of Permaculture Teachers (I've co-taught these courses since 2006). * Gardening, forest gardening and growing unusual plants and trees (I've taught forest gardening courses since 2011). * Using systems thinking and natural patterns in design (I'm currently writing my second book on this topic). * Applying permaculture thinking to the care of our own bodies (since 2011). 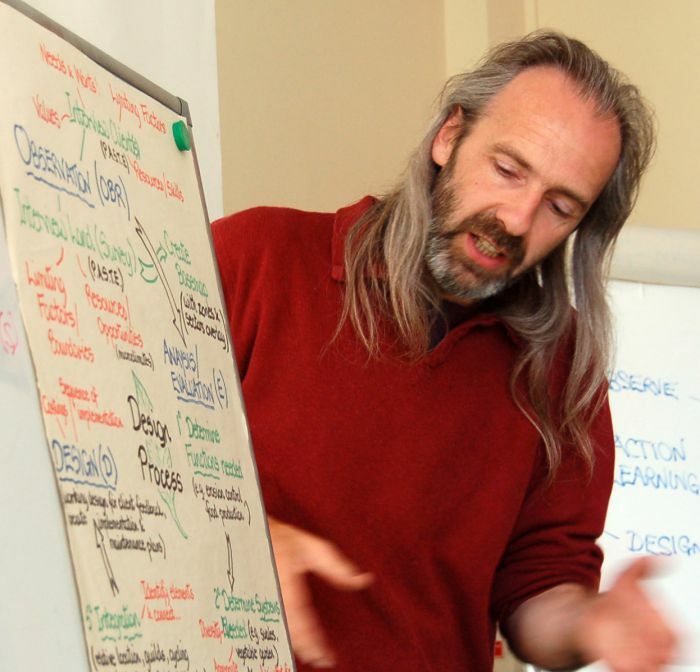 * Creating permaculture livelihoods (I teach short courses on this topic too). * A number of gardens, designed and implemented since 1996, mostly my own. * Some consultancy since 2004, including a few smallholdings.